I recently received a Sake photograph sent through social media by Mark, a biker friend of mine; as he wanted to show off his gift brought over by his friend from Asia. What attracted me the most in the photo was the Sake’s brand name, 国士無双 大吟醸 (Kokushi Musou Daiginjo in English). It’s a Daiginjo Sake not available for sale at the LCBO stores. I had an urge to steal it from Mark! Possibly Mark had sensed my desire; and he was kind enough to invite me to taste the sake with him. I was overwhelmed by the invitation and quickly agreed to meet him for dinner. 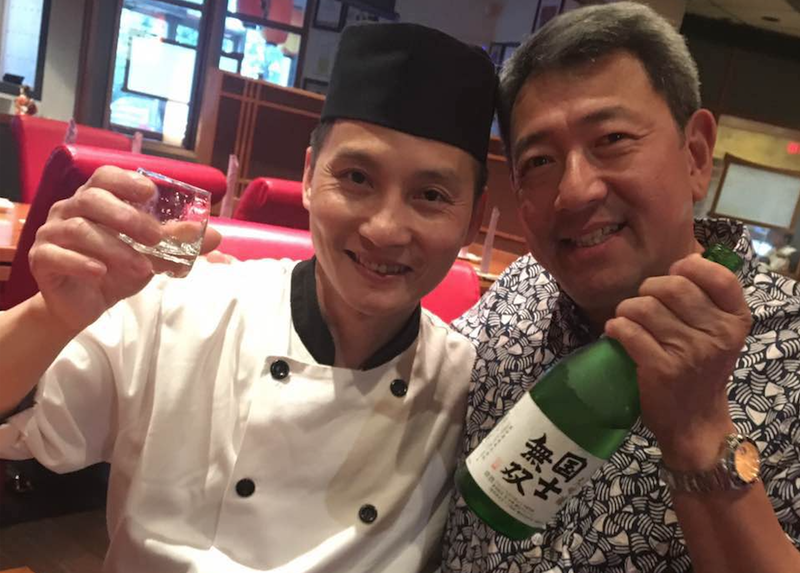 When I arrived at Akasaka Japanese Restaurant & Teppanyaki Steak House in Richmond Hill, the Kokushi Musou Daiginjo Sake was put on ice. The bottle’s label showed that the alcohol content was between 15% and 16%. The rice used was Yamada Nishiki, which had been polished down to 40%. Kokushi Musou is known to be a men’s sake. The masculine image starts with the brand name. When Takasago Shuzo (Sake Brewery) created this line of products in the mid-1970’s, owner of the brewery named it “Kokushi Musou”, meaning “the brightest and bravest warrior in the world”. The name was derived from the Chinese historical anecdotes related to Han Xin, the military commander contributed greatly to the founding of the Han Dynasty about 2200 years ago. The famous hero of ancient China was thus used to help Kokushi Musou build a tough male macho image. Then the brand image has been further strengthened by the characteristics of Kokushi Musou products. They all tasted dry since they had been invented. In Japan, sweet sake is regarded as a women’s choice; whereas dry sake is for men. Nowadays, the dryness in 10 types of sake under the brand name “Kokushi Musou” has become a signature taste, which helps differentiate the brand from rivals and allows them to successfully project an image of masculinity in the market. We started off our dinner with a boat of assorted sashimi and sushi, all chef-selected; as Stanley, the master chef of the restaurant, is Mark’s long time friend. He also introduced the hand-picked wasabi stems to us. Although it’s quite common to have fresh wasabi available in grocery stores in Japan, it certainly is not common here in Canada. The extraordinary experience with fresh wasabi was that it did not distract me from the mild goodness of raw fish like the over-powered artificial wasabi. I had time to note the taste and texture of the fish before I felt the burn. Meanwhile, our waitress came over to open the sake for us. Gentle and delicate aromas danced around my nose. Daiginjo being the brand’s highest quality sake carried the signature personalities of Kokushi Musou. Taking its +4 SMV and 1.1 acidity into account, the sake was expected to taste dry and light. The first sip into my clean palate without food made a huge impression on me with its dryness. Then I ate a piece of sashimi with soy sauce, and my second sip of sake tasted differently. The sashimi-Daiginjo pairing was a match made in heaven as the sake’s dry taste had been reduced while its subtle flavours, such as the mild sweetness, were being brought out. The overall flavours became well balanced with a crisp and refreshing aftertaste. The Daiginjo also complemented the soy sauce based foods by downplaying the saltiness yet bringing out the natural umami taste in fish. Stanley took a break from cooking and sat down at our table to taste sake with us. Both Stanley and Mark could identify the signature characteristics of “Kokushi Musou” Daiginjo, and they were impressed with the sake’s rice-forward flavour. Having a great experience with Daiginjo and sushi, Stanley wanted to experiment how to pair Daiginjo with cooked fish. He grilled a salmon head with salt and pepper in Japanese style. Then we found the dry sake worked well with salty cooked fish too, as the drink effectively reduced the intensity of saltiness in food, and filled our mouth with well balanced sake flavours. In Hokkaido, Takasago Shuzo is the oldest sake brewery in the Prefecture’s second largest city, Asahikawa. Established in 1899 under the name of “Kohiyama Shuzo”, the brewery merged with another sake company in 1965 to form Takasago Shuzo. Today, Takasago Shuzo produces 900 kilolitres of sake per year. The amount is relatively small because the company wants to focus on brewing high standard craft sake. Winter in Asahikawa is long and cold that temperature easily drops to -20C, Takasago Shuzo makes use of the severe cold and heavy snowfalls in wintertime, and turns those to become advantages for sake making. Every year when temperature drops to -10C, staff at Takasago Shuzo start to build an ice dome in the property, where Daiginjo sake is to be produced. Since the interior temperature of the ice dome is maintained at -2C, the cold environment kills bacteria, and allows the workers to use the “Ichiya Shizuku” (drip overnight) method to separate the clear sake from the fermented rice lees. When the method is applied, the moromi mash (freshly brewed sake) is poured into a number of small canvas bags, which are suspended inside a giant barrel to let sake drip out from the bags on gravity. Hence, without external pressure, the fine and clear sake is filtered out. Takasago Shuzo mentions in the company’s official website that “Kokushi Musou” Daiginjo can be served chilled and warm. I already had tasting experiences with cold Daiginjo, therefore I want to taste it warm if I have the opportunity to drink “Kokushi Musou” again in the future. A friend of mine who has experienced the warm “Kokushi Musou” Daiginjo advises to warm it up to 50C, and then drink it with grilled fish. That’s the best winter treat.